Hi Everyone! The last month has past away so fast and now it's already August. The last month I was on holiday and I didn't use much makeup. But these 4 products went with me on my holiday and I want to share them with you. 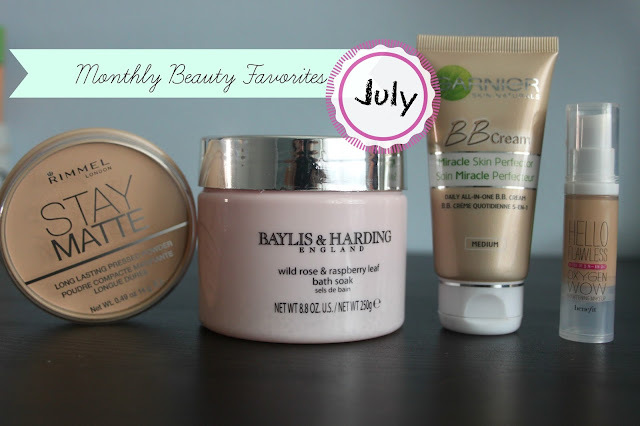 So, without blabbing any further... here are my July favorites. I purchased this powder during my holiday and I love it. My skin is very oily, so this powder really makes my skin matte. I bought my skin tone based on what the package showed and it's the perfect shade for me. I got this bath soak from my sister and it's nearly empty. I've used this so much the last month that I'm a bit obsessed now. It smells heavenly of rose and raspberry and I can't get enough. It doesn't leave your skin dry after a relaxing bath and you smell amazing after you use it. Unfortunately it doesn't give the water a color but anyway, I LOVE this bath salt! This product is the one from the "How to look the best at everything - Kit " from Benefit. I wrote about it a while ago. I leave you the link here if you want to check it out. I absolutely love this foundation and I took it with my on holiday because the package is so useful that I can carry it in my bag. Ever tried one of those products? Do you have any beauty favorites this month? Let me know in the comments! Thank you :)Have to try the body shop BB cream, have heard many good things about it! Great products Catherine. I'm interested in trying the Garnier BB cream. I have oily skin as well...how long did it last before you got oily? Is the benefit hello flawless low coverage? Or is it quite thick? Your blog looks great as well!